The Knights of St. Andrew consists of a unit of dedicated Scottish Rite Masons, and exists to provide a service organization on behalf of all members of the Great Falls Consistory. The Knights of St. Andrew are under the immediate supervision of the Secretary of their Scottish Rite Consistory, and provide services where they are needed. The Knights of St. Andrew act as mentors and guides to candidates during reunions, communicate to candidates the degrees not performed during the reunions, host the Valley’s education group, and assist with Scottish Rite degree work. We strive to nurture and develop future leaders as they learn their organizational and leadership skills, explore the inner structures of their Scottish Rite Centers, and thus gain a deeper admiration for our Order and Brethren who work in Freemasonry as a whole. 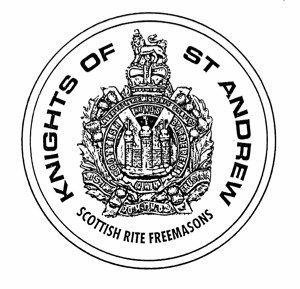 Th Knights of St. Andrew’s membership is restricted to 32nd degree Scottish Rite Masons. Any brother who has not received his KCCH is eligible to join, and those interested in becoming involved should contact an active member. Those brothers who have received the KCCH are not eligible to join, but those who were members of the Knights of St. Andrew prior to receiving their KCCH become associate members, and may not hold office or vote. The Knights of St. Andrew’s flexibility and enthusiasm make them one of the Valley’s most active organizations. If your interest is in gaining more understanding of the history of the Scottish Rite or Masonry in general, developing a better understanding of the various degrees, or just helping the Valley any time it needs assistance, the Knights of St. Andrew will provide the opportunities and resources to let you reach your full potential while helping to support the Great Falls Valley.